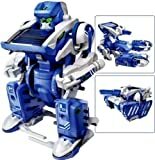 – 100% brand new and high quality 6-in-1 DIY Science Educational Solar Power Robot Toys Kit. 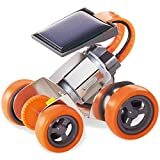 – With the included 21 parts, children can DIY build 6 different models such as Solar Revolving Plane, Solar Windmill, Solar Plane, Solar Airboat, Solar Puppy, Solar Car. – Help teach children the benefits of solar energy while they create a toy that is both fun to play and requires absolutely no batteries. – Great assembling toy for kids to practice using their brains and learn the benefits of solar energy. – Also ideal to express your kids interest in science, extremely helping your children on creation. – Sunlight shine solar panels,provide small toys with endless power. – Easy to assemble by following step by step instructions. 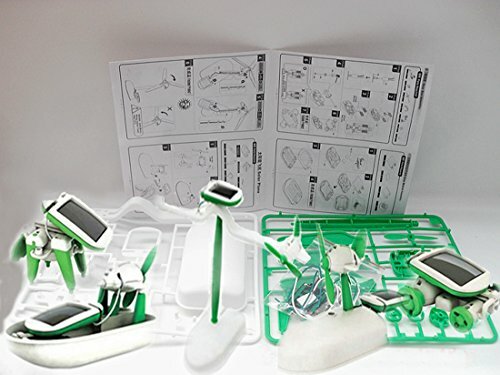 – Different from other torpid model toys, those solar robot kits will move after assembled.